Plans have been put forward to build accommodation for 100 students on rural land between Leamington and Kenilworth. The applicant, Vik Tara, is seeking permission from Warwick District Council for the construction of five ‘eco-buildings’ incorporating ten cluster flats to include 100 bedrooms in total with en-suite bathrooms and ancillary accommodation for use as student accommodation at Chesford Bridge House, in Bericote Road, Blackdown near the Ramada Hotel. 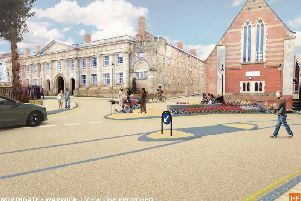 The plans for the site show car parking spaces but it is also located near a bus stop for routes into Coventry, Leamington, Kenilworth and Warwick University. An accommodation need statement highlights a growing student population and says: “The applicant considers the proposed development at Blackdown to be ideally located to deliver effective and sustainable student accommodation. Objections to the plans have been made to the council. Michael Jeffs, of the Warwickshire Branch of the Campaign to Protect Rural England, said: “The site is in the narrow Green Belt between Kenilworth and Leamington Spa and we believe it must be protected for generations to come. “There are no exceptional circumstances in this application to justify building student accommodation on this site. Residents of Ashow, the village nearby, have also objected. One said: “This ridiculous application is wholly unacceptable and must be dismissed out of hand.